Sometimes known as PCOS, or occasionally Stein-Leventhal syndrome, this is a female illness characterised by period disorders, obesity, acne and excessive hair growth. These symptoms may be present to varying degrees or there may be virtually no symptoms at all. This remains unclear but genetics may be a factor as PCOS seems to run in families. 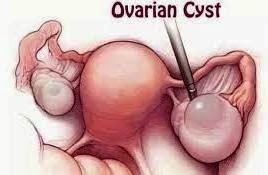 What is certain is that the ovaries of women with PCOS almost always contain a number of small fluid-filled cysts (hence the name). These in themselves may not be the whole answer however, as such ovarian cysts can be seen in women without PCOS. 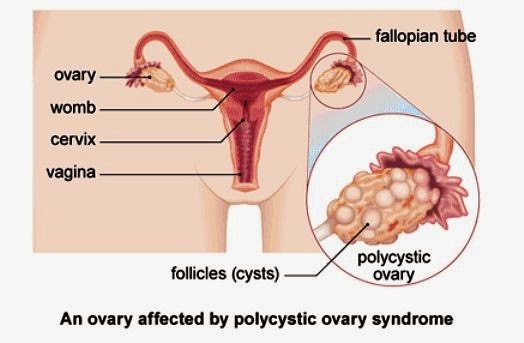 What Are The Signs And Symptoms Polycystic Ovary Syndrome? In women with PCOS, the hormones are out of balance and they will have period problems. These are usually in the form of irregular or absent periods, and the diagnosis may only be apparent when problems with conceiving arise. This is because women with PCOS do not automatically release an egg every month. They also have, to varying degrees, acne (usually facial), excessive hair (often dark and on the arms, legs and face), and obesity which worsens with age. PCOS as such is not dangerous, but women with it have a greater risk of having high blood pressure, heart disease, diabetes and cancer of the womb. These risks are greatly reduced however with proper treatment. • Blood tests. A general blood test will be taken initially including a full blood count, liver and kidney analysis as well as an analysis of the thyroid gland and a prolactin test which is a milk-producing hormone and is raised in PCOS. More specialised tests include testosterone (which may be elevated) and leutenising hormone, or LH which is also often high. • An ultrasound scan. This is the same type of scan which pregnant women usually have, and involves passing sound waves through the body to build up a television picture showing the size, shape, and any cysts of the ovaries. It is completely painless and no injections, dyes or X-rays. Regular exercise, a healthy diet, weight control and not smoking are all important parts of treatment for polycystic ovary syndrome (PCOS). You may also take medicine to balance your hormones. It is important for women with PCOS to have regular periods as this will reduce their risk of womb (uterine) cancer long-term. In younger women these are often induced by taking the contraceptive pill, but if contraception is not wanted then a tablet called clomiphene ('Clomid') can be taken to trigger egg production and ovulation. The Pill can sometimes improve the skin of women with PCOS, and a water tablet called Spironolactone is sometimes also used for this purpose as well as reducing hair growth. Surgery is sometimes performed if all else fails, and this is known as a 'wedge resection' where a piece of the ovary is removed leaving everything else untouched. It is unclear why this should be effective but it helps a number of people with PCOS. What Course Will Polycystic Ovary Syndrome Follow? If untreated, PCOS increases the chances of infertility as well as causing increasing weight gain and the risk of the illnesses mentioned above. If treated however, women with PCOS should expect to lead a full and active life, including having children. It is important for people with PCOS to eat sensibly and follow a structured exercise programme. This is to reduce the chances of increased weight, as well as helping reduce the risk of developing heart disease and diabetes. 1. When did you first notice any symptoms? 2. What is your normal menstrual cycle? 3. Have you noticed your skin becoming more spotty or hairy? 4. Are you putting on weight despite trying not to? 5. Have you been trying to have a baby without any success? 1. Will Any Children I Have Be At Risk Of PCOS? 2. Are there any foods I should avoid? 3. Am I still able to get pregnant at any time? 4. How long does any treatment take to work?